This section is dedicated to the accessories and consumables from the Omniprobe family of Nanomanipulation Systems, including AutoProbe™ 200, AutoProbe™ 250, AutoProbe™ 300, Short-Cut™, OmniGIS™ and SST™ 400-1. Custom tip designed with a nickel tube shank and tungsten tip. Tip radius is 0.5µm with 13° taper angle for maximum lifetime service. Custom tip designed from tungsten. Tip radius is 0.5µm with 13° taper angle for maximum lifetime service. Custom tungsten tip with a stainless steel shank, for use with AutoProbe™ 300, in-situ probe tip exchange systems and Short-Cut™. Tip radius is 0.5µm with 8-10° taper angle. This tip is also Short-Cut™ compatible. Custom tip designed from tungsten. Tip radius is < 0.5µm with 13° taper angle for maximum lifetime service. Custom tip designed from tungsten. Tip radius is < 0.5µm with 6° taper angle for maximum lifetime service. Compatible with Short-Cut™ system for direct conversion to TEM grid. Xtreme Access Probe Tip Holder for use with ½" tungsten probe tip, #75960-04 and #75960-06. Comes with a storage vessel. 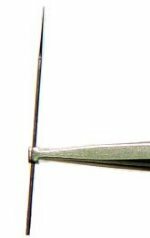 AutoProbe™ 250 probe tip holder uses the tungsten probe tip #75960-05. Compatible with the Short-Cut™ for direct conversion to TEM Grid. Comes with a storage vial and handle. Straight End Effector for Xtreme Access probe shaft. Copper (Cu).